~~GuRu bHaI~~: Mr.So called Underachiever! 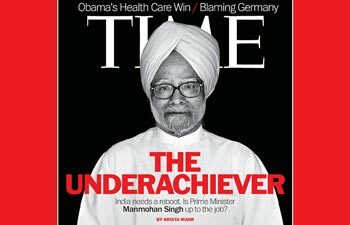 "Underachiever" tagline has become viral globally about our "Mr.So called Economist" a.k.a Prime minister of India Dr.Manmohan Singh being revealed by the most ubiquitous British daily newspaper TIMES recently. Before getting into useless debate and discussions over this British media on criticizing Indian Prime minister, it is kind of necessitated task of contemplating from our shore first. How come this faineance sickness of our Democratic leader has gone for the visibility of the global floor? Talk of the town kind of issue about this fellow used to happen nationwide has reached the multinational exposure now! Undoubtedly, it has now become a disgusting fame to our national prestige and could even an alarming intimation to our multiple foes beyond the borders! By the way, who is this Underachiever? Just rewind back a decade for a brief recall about him! Many of us have almost forgotten this gentleman's marvellous achievements and contributions to the Indian economic history. It is a well known fact that we Indians are good in culture but bad in memory in all means! So, let us get to know about this gentleman again. Apart from being the Alumni of Cambridge and Oxford, he had been the RBI governor from 1982 to 85. During his tenure, he had introduced many radical banking policies and incorporated many new inductive measures in RBI Act which are still considered to be the remarkable milestones in Indian banking industry and are being followed. Later on, he had become the deputy chairman of Planning commission during when he had been thoroughly appreciated for purveying many significant decisions in implementing many profitable financial moves. He has won multiple accolades for his contribution towards country's effective capital turn over and resource utilisations for many inductive plans throughout the country from then economists and critics. Finally, this economist had turned to a politician and had become the Finance minister of India during 1991. It was the period where India was in a desperate need of economic reforms since the climate was extremely bad globally just as it is today. This novice finance minister with the help of then Prime Minister Mr.Narasimma Rao had restructured all our existing economic policies more than partial and the whammy machinery to a completely innovative system which comprised the induction of International investments in Indian markets for the very first time. He had completely slashed the domestic subsidies and eliminated the unnecessary bureaucratic controls on patenting and licensing on Indian trade. He had encouraged the internal and external entrepreneurs to proliferate the competitions among the domestic and foreign business means. Also, he had simplified the tax structure and minimised the profligate patents. This bold reform had brought a revolutionary energy to the Indian economy to stand out of the global market. In 1994, he had passed a budget in the parliament which had created about 10 million jobs in the country and had been considered the best budget of the nation till today. It was only during his period, all those economic terms like GDP, Fiscal deficit, inflation were positive and in favour of grooming Indian economy. These are just a part of his extraordinary contributions to the Indian economic world! Such a tremendous gentleman is called Mr.Underachiever today!Doesn't sound awkward to us? But, why such a descending transformation on this iconic personality? Again, it ends up rhetoric if you contemplate! Now, this economist has been our Prime Minister for almost 8 years. Such a intellectual brain which has been responsible for such amazing achievements is stupidly called "Underachiever" for being a poor headed decision maker. Can we able to imagine a small cue at least? Yep! Mere a power cannot help a man to incorporate all his perspectives and decisions on a ruling! It is the Italian remote control matters here which has taken his job. So, he has nothing to do with his role other than being oblivious to all the queries thrown by media, opposition and people towards his dais. Even he had learnt to stay dumb for all those abysmal criticisms by all giant tycoons of the country! One man's intelligence cannot carry this hugest democratic economy forward! Only intellectual togetherness in power could make some sense in public welfare which is quite impossible in this corrupted political ambience. Anyways, the only recent consoling happening is the resignation of Bengali parliamentarian for the thirst of becoming the first citizen of the country who was holding the post of economic godfather till last week. At least now, this underachiever has got a fantabulous opportunity to disprove all those false and misconceptions about his rule over the country all these years by becoming the current Finance Minister of India. Finally, he has got his deliberate role to promote the economic slowdown of the country in all means at present to avoid imminent deceptive recession or whatever! Hope the Italian clench would loosen in his newly bestowed role at least to let him to do his deserved dedication for God's sake. Also, it is his retributive duty to keep us out of this intimidating economic offing! Let him make the same British Media to apologize in the imminent publishes for such a vulnerable descriptions about him by achieving esteemed economic measures just like his historic ones! Some people feel contrary to the concept of actors become politicians. But now they may start to feel its better than politicians become actors. I mean our acting prime minister manmohan.